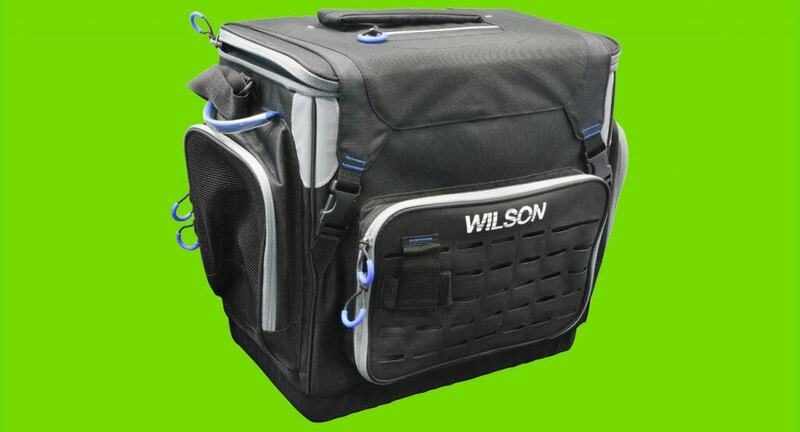 The Wilson Fishing Platinum Tournament Bag is a large hold-all tackle bag supplied with eight waterproof tackle trays, to fit enough tackle for any trip. There are three outer pockets, two of which are constructed with open mesh to allow the stored product to breathe and dry out, making them perfect for things such as fishing gloves, packets of plastics and more. The front pocket is fully enclosed and will suit lure sleeves and the like, and on the front of this pocket is a tool holder that can accommodate any tool you’re likely to need, and may even be used to dry lures on! Up top there is clip-attached cover that houses a carry handle and a mobile phone and wallet compartment. Underneath this cover is the zippered top that gives access to the eight waterproof trays. On the sides are two sturdy, plastic sleeve covered carry handles and a padded shoulder strap. The bottom of the bag is constructed from waterproof, formed and condensed plastic foam, giving your tackle protection from water ingress from below and creating a solid base that will never collapse.